LUXURY LAKEVIEW VILLA CLOSE TO DISNEY, DISCOUNTS AVAILABLE. GREAT REVIEWS. Please check our guest reviews and the average rating which can be accessed by the Homeaway 'sort by' selection and you will find our villa is of a very high standard and constantly received great reviews. Our 4 bed 4 bath self catering villa is within a short distance of all major Orlando attractions. Sleeps 8. Games room featuring Pool Table, Table Football & Dart Board. 30' x 15' Pool with spa overlooking the entire lake. Open Plan Lounge/Dining area with double sofa bed and a 55' Smart TV with Home Theatre System, Internet access, Wii console also supplied. Fully equipped luxury kitchen with whirlpool appliances and island breakfast bar with stools. All Bedrooms have 20' LCD TV's. Highchair supplied. Professionally interior designed furnishings. On site Club House with Pool, Gym, Wi Fi internet access, kids play area, basketball & volley ball courts. Ideally situated for Disney,Universal,golf etc. Book direct with the owners and save! This is a fabulous holiday rental with views from the pool and decking that you will remember. Read our great reviews! Bella Vida Resort: Bella Vida is Italian for 'Beautiful Life' and this is what Park Square Homes have achieved. From the time you enter the gates and see the ornamental gardens and Club House you will know you are in a luxury Resort. On arrival at the Villa you will be enchanted by the view of the entire 20 acre lake from the pool deck. The barrel tiled roofs and the colourful exteriors of the properties together with superb landscaping will make it a memorable vacation. For your peace of mind, the villa is fully alarmed with a contract in place with ADT Security for immediate call out plus you have the 24 Hour manned entry security gates. Location: Head for the US192W and locate Medieval Times Dinner Show, take turning to go behind the castle like building (Oren Brown Rd), you will go past the entrance to Walmart Super centre, and Bella Vida will be located directly on your left hand side. We live in the UK but have been traveling to Orlando for many years since our children were small, they are all grown up now with their own families and all enjoy Orlando as much as we do. 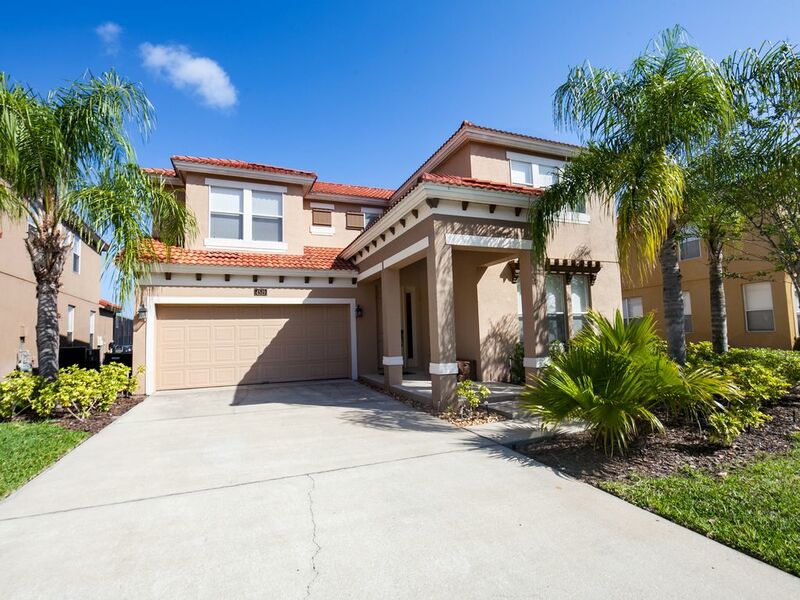 We hope that our villa in Orlando becomes a home from home for our guests. Each bedroom has its en-suite bathroom and toilet finished to the highest standards with Vanity units,marble sinks & floor tiling. Ample power points for hairdryers etc. Please ensure that the patio door is kept closed at all times in order to ensure that the Air Conditioning unit runs efficiently. Driveway & designated parking bays. No on road parking. One end gently slopes in so ideal for younger children. Ideal for families or couples wanting luxury accommodation with stunning lake views, close to Disney, Universal, Sea World, Florida Millenia Malls, Premium Outlet Mall, Golf Courses. Other activities close by are Tennis, cycling, horse riding, nature walks and trails, fishing, air boat rides, hot air ballooning. Bella Vida Resort is a luxurious complex built by Park Square Homes, one of America's leading house builders. The quality of the Resort can be instantly recognised when driving through the manned security gates. The Resort has a 6,700 sq ft Club House, concierge service, also all guests have use of the large zero entry pool, fitness room, internet room, basket ball and sand volley ball court, childrens playground. This property is managed by a local Management Company and readily available for all our guests should they need to contact them. One of the main attractions of this property is the stunning view of the 20 acre lake from the pool deck. This property lived up to all of our expectations. Everything was as advertised and then some! The owners provided a seamless procedure for booking the rental and were extremely helpful in providing information related to questions we had regarding the unit and the surrounding resort. They demonstrated a genuine desire to provide a memorable experience for their guest. The house was extremely clean and tidy. All furnishings were in very good condition and the unit is decorated very tastefully. We were provided adequate cleaning and paper supplies to get us started and the lovely kitchen was very well equipped. The four bedrooms were spacious and each was equipped with a full bathroom. Beds were very comfortable and there was plenty of additional bedding and towels provided. The outside pool area is fabulous! The screened Lanai was very spacious and super clean. The hot tub was a real hit with the younger member of our party as well as those of us who just wanted to relax and enjoy! There is an excellent walking track that circles the pond where you can be treated to viewing numerous fish and the occasional alligator sunning itself on the bank! The large clubhouse offers a superb lounging area, exercise room, games room, and a well equipped business center. The location is super as you are within walking distance to a Super Walmart Store and only minutes away from a multitude of restaurants, Old Town and Disney attraction. We would certainly rent this property and highly recommend it to family and friends. Thank you for the lovely review and glad you enjoyed your stay. We hope to have you stay again in the future. We had a great time, clean, comfortable, lots of space for everyone and easy to access areas of interest near by. Kids loved the pool!! From the moment we walked in the door we knew we chose the right house for our 2-week vacation. The house was clean and provided everything we needed to settle in and feel at home. We were fortunate to have above-average temperatures and used the pool and spa nearly every day. The pool heat was a must for this time of year and was provided at a reasonable cost. Well worth the money. The location of the house gives an excellent view of the lake and could be enjoyed from both inside and outside. We got our morning exercise walking around the lake and enjoyed looking for different wildlife--alligators, turles, fish, birds, etc. Wal-mart and Aldi are both very close to the house and were a great place to pick up supplies to make some meals at home. . There are many restaurants nearby as well as dinner shows. We went to Capone's and enjoyed the food and show. The parks and area attractions are nearby. Most times you can get to your destination in 1/2 hour. Paula was great to deal with, and we would highly recommend this home. Great property, very easy to work with owner. Decided on a trip to Disney very last minute (about a week and a half before we went) and was happy to find a very well reviewed property available on such short notice (looking at the calendar this is booked pretty far out, so that was lucky). Paula was very responsive to my questions and flexible when I needed to potentially extend my trip due to snow in the Northeast. The house is as described in the ad/pictures with 4 bedrooms, all with their own bathrooms. Plenty of space for a larger family if needed. The pool and especially the hot tub was fantastic after the park, also with a very nice view of the water behind the house. The heat worked great even with some low January temps. The resort is nice with 24 hour security and close to the parks. From driveway to parking lot is an easy 20 minutes. Lots of stores and restaurants nearby. Overall a great experience. We try hard to ensure that all our guests have a home from home experience and are happy to interact with our guests. We look forward to you returning! Great family trip to Disney World! From the moment we opened the front door, we knew our stay at Bellavida would be a pleasant one! The house is so clean and so quiet! It is well-stocked with everything from cooking basics to linens to a small library! Quiet walks around the water were enjoyed on our non-Disney days. Though we didn’t make much use of it because we were at Disney so much of the time, the garage converted game room is a great addition! Overall, our family had a wonderful trip to the Orlando area and know that the top notch accommodations of this home are a key reason we enjoyed our stay so much. Thank you for sharing your rental home with us so that we could create some amazing lasting memories. We had a wonderful Disney vacation at this beautiful home. Grandchildren loved the pool and hot tub. The owner and management company were very accommodating. I highly recommend. The above rates do not include pool/spa heating which is $18 per night. A booking deposit of 25% is required to secure the booking, the balance/damages deposit is due 6 weeks prior to arrival. A damages deposit of $150 ($200 for 7 or more guests) is required on all bookings. For full terms and conditions please contact the owner. Once payment of booking deposit has been received you are accepting our terms & conditions.